Today, I stand before you, as a humble servant of the people of Garden Route, to deliver this inaugural state of the District Address, which will clearly reflect on our current programmes and plans going forward. One amongst us reminded me, that this day marks 955 days for this Council in office. In our magnificent diversity as this council, and despite our differences, we resolved to advance the values of our Constitution and to once again place at the center our district agenda of the poor, unemployed, marginalised and address inequalities. Madam Speaker, the President of the Republic of South Africa, proclaimed 8 May 2019, as the date in which the country will hold its sixth (6th) national elections. As we count down, the elections will exactly be 26 days from this day, and we must be reminded of the millions of people that waited hours in long queues to cast their votes in a democratic South Africa in 1994. Accordingly, we dare not take for granted our right to vote. In our country, 17 million of those eligible to vote are young people. However, only 8 million of these have registered to vote. We need to collectively encourage our people to vote on 8 May 2019. As we gather here this evening, we are all well aware that today the District of Garden Route is blessed with tremendous progress. Moreover, because of that I am proud to share that the state of the District is strong and getting stronger. Over the years, our district has undergone major changes, especially in the administration. We have reconfigured our organisational structure to meet the changing circumstance and to address the demand. We have also improved our Inter-governmental Relations Structures a platform aimed at promoting and embedding good governance with full participation of B-Municipalities and Sector Departments operating in our space. This has assisted in building sound relationships and a united district. Madam Speaker, our population has grown to 635 600 (2019) estimated to 679 213 (2024), the built environment of our district has changed profoundly, as the result of access to basic services as from 2016. The population is expected to grow in our region at a rapid pace – research done by South African Cities Network reveals that 63% of the current population in South Africa reside in urban areas, this will rise to 71% by 2030. By 2050, 8 in 10 South Africans will live in urban areas. This places increasing demand on basic infrastructure requirements. Despite the challenges we may be confronted with in the near future, there has been remarkable improvement in the level of service delivery in our region. Madam Speaker, these qualitative changes in the lives of the people of Garden Route represent a towering monument of progress during the twenty-five years of our democracy. Working together with all sectors of the population of our district, we must do everything in our power to ensure that this progress is consolidated and all enjoy the opportunities. Given all the achievements as indicated, in the humankind it is the law of life that every achievement is accompanied by its challenges. Our district is confronted by perpetual dependency ratio which has grown to 56, 1%, with a proportion of poor people below poverty lines within the district standing at 40, 5%. Risk 1: Slow Economic Growth. Risk 2: Increase Population & Demand for Services. Madam Speaker, there is no doubt that our programme to reposition Garden Route District and enhance its relevance has captured the imagination of thousands of people. We are creating an enabling environment for the growth and sustainability of our district. Consultation is underway with all affected stakeholders. We intend this to be collaborative process; we will not impose ourselves but will work with our partners as equals. Healthy and Socially Stable Communities; Expenditure R47 Million. A skilled Workforce and Community; Expenditure R15 Million. Bulk Infrastructure Co-ordination; Expenditure R170 Million. Environmental Management and Public Safety; Expenditure R62 Million. Good governance; Expenditure R77 Million. Financial Viability; Expenditure R24 Million. An inclusive District Economy; Expenditure R13 Million. Our total expenditure for 2019/2020 financial year is estimated at R410 Million, inclusive of capital and operating expenditure. GRDM is currently operating the Roads function on an agency basis on behalf of the Department of Transport and Public Works. The Roads budget forms the biggest portion of our budget. Madam Speaker, we will also leverage on municipal assets through property development towards economic growth and sustainability of our district. Resolutely on March 2018, we hosted a two (2) day Garden Route Investment Conference themed “Creating Opportunity in Global Uncertainty”, which involved domestic and international investors in an effort to attract investment and positioning the Garden Route region as the investment option outside Cape Town. In looking further at the journey we want to traverse, it would be naïve of us not seek for investment opportunities to stimulate the economy of this region. We did this as Garden Route District Municipality! Before the President of the Republic of South Africa announced this summit for the Country. We were indeed pro-active on our efforts. This platform was not intended to benefit GRDM but it was a concerted draw-card for B-Municipalities to outline their investment propositions to various investors. I can safely report that there is positive commitment to invest in this region. Last year we signed a couple memoranda of agreements with different companies local and others with massive international footprint. Collectively bringing a total investment of over R2billion in the GRDM region. I am quite certain that you have witnessed the turn-around strategies that we have implemented on our properties in various print media platforms. Negotiations for a long-term lease agreement are close to completion with Len24 GmBH (a company that originated in Germany) and Ithuba Credit Corporation (a company that originated in USA) on the management, operation, and renovations of Calitzdorp Spa and De Hoek Mountain Resort. The lease agreement is the cornerstone of a key social-entrepreneurial venture, which will have an immense socio/economic and environmental impact on the region. The lease will attract a multi-million rand investment into the local economy, boosting job creation and reducing unemployment, investment in relevant and quality skills development, and investment in green technology at the resorts. We are focusing our attention on programmes on the key parts of the economy that are labour intensive. These include Agriculture and Tourism. The potential of agriculture in our region for job creation and economic growth remains largely underdeveloped. Our region has large areas of unproductive land or land laying-fallow. To this end, our focus on properties is not merely influenced by investment drive. In our effort to grow the economy of the region particularly focus on SME’s development, and empowering previously disadvantage SME’s Council has taken a decision of availing vacant land for economic development initiatives. An MOU with the Department of Agriculture is being finalised for the development of emerging farmers. We have already leased land to black farmers for Aquaponics farming in Glentana and Western Cape Honey-bush Tea near Oudtshoorn. It is for this reason that we launched an SME Export Development programme as resolved by the 2018 GRDM Investment conference, which entails one-one-one assessments of SME’s with products that are ready for the export market and also serve an incubation centre focusing on logistics and market access. An MOU with SEDA has been signed and funding will be availed for SME’s to partake in this programme. Our efforts of marketing the region as a prime destination of choice is gradually yielding results. This is a result of the sound and impeccable relationships that have been established by the GRDM with Local Tourism Organisations (LTO) and [the] Private Sector. Our team is currently attending as Garden Route and Klein Karoo the World Travel Market in Cape Town. We are also planning to attend the Tourism Indaba in Durban, Gauteng Gateway and next financial year, for the first time, attend the Namibian Tourism Expo. These platforms enable us to sell the region as a destination. We will deepen the partnership between government and business to realise our vision of increasing the number of tourists to our region. Our highest priority of enhancing destination marketing was evident in the four (4) events that we financially supported i.e. Herold Meander Saxophone Festival, Ostrich Crawl Festival in Oudtshoorn, Mossel Bay Soul Festival and Hessequa Proe Bietjie Festival. 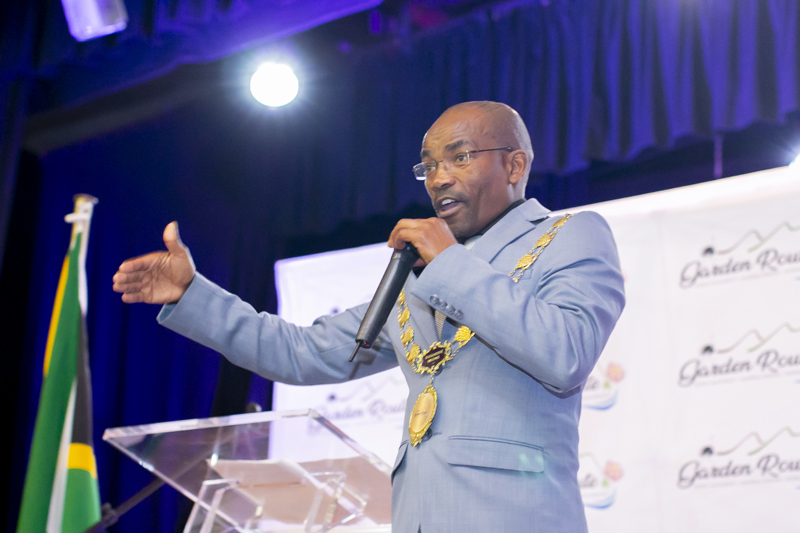 For 2019/20 financial year, Council availed an amount of R130 000 for the development of the Kannaland Tourism Strategy. A draft strategy is now available inclusive of a proposed structure to drive the strategy to be discussed with Kannaland Municipality later this month for final adoption in June 2019. Madam Speaker the Cater Care project is a skills programme focusing on training the unemployed youth for the hospitality industry to either move on to become an assistant Chef as part of career pathing in the chefs industry and or starting their businesses. Its’ successfully implemented in partnership with the Francios Ferreira Academy for the last 8 years with a zero dropout rate. Participants also include vulnerable youth such as people living with disabilities. Approximately 200 youth benefited from this programme since inception. We increased the allocation for 2018/19 financial year and we will again implement this programme for 2019/20 budget. Over the past two years, our region has been under siege by wildfires, which ravaged our area. These fires did not only destroy our vegetation that brought the aestheticism in which our area’s fondly known for, but also destroyed valuable properties of people staying in our region. Whilst we once again sincerely convey our condolences to all the families that lost their loved ones, we must also extend our profound gratitude to the firefighters that fought these fires. Their efforts will never go unnoticed and they are our ambassadors of goodwill. Our Spatial Development acknowledges that our Economy is the Environment. Therefore, any rehabilitation and restoration of the natural environment needs priority. As such, we have assisted and motivated for Disaster rehabilitation and Reconstruction funding to the value of R75 million which was approved by National Treasury after the 2017 Knysna fires. As our area is prone to these disasters, our fire risk assessment project is set to be completed by April 2019. Furthermore, as a District, we recently developed an Invasive Species Monitoring, Control and Eradication Plan, which is a requirement for organs of state to have in terms of National Environmental Management and Biodiversity Act (NEMBA). Madam Speaker, Today I want to share some thoughts about our collective future – in particular, about the challenges we face in developing a secure, more resilient and more sustainable energy system in the Garden Route region. Our planning department is doing a scenario approach to energy as the driver of the local economy. The scenarios cannot predict the future, but they can give us the tools to anticipate what could happen. In other words, they deepen our strategic thinking. that is currently participating in the Small Systems Embedded Generation (SSEG) programme. This goes on to show how much the district value and prioritize renewable energy as the future of the region. The country faces an incredible challenge to meet our future energy demand, to reduce greenhouse gas emissions, and manage the stresses on our water and food resources. GRDM believe governments and industry can take far-sighted actions now that will reap benefits for decades to come. These actions include taking advantage of the region’s abundant natural resources, localised manufacturing and storage technology, and focusing on smarter urban planning. The District would also like to leverage some of its properties to support this goal of energy sustainability in the region that will in turn promote socio-economic development. We remain committed to working with all the stakeholders to realise the region’s ambitious energy objectives of energy driven regional economy, energy driven job creation and energy driven livelihoods. Madam Speaker, as the District we are enthralled by the reports about the Brulpadda block in the Outeniqua Basin, which even the president described as Game Changer. This could well be a game-changer for our region and its benefit will transcend throughout the Country. In unison, we must congratulate Total for this discovery! We currently working with Transnet Ports Authority, PetroSA, ACSA-George and Mossel Bay packaging an application for this region to be considered as the next Special Economic Zone. We concluded a very successful meeting with Department of Trade and Industry (the DTI) which advises the Minister on such applications. I must attest that we have received positive response from the Department. Honourable Councillors, we have reported in Council that plans are afoot to construct the regional landfill site. This is a project, which has been on the pipeline for the last 10years. In July 2019, the contractor will be on site. The Regional Waste Management Facility preliminary prediction – job opportunities: 150 temporal and 30 permanent jobs but will escalate, as the project is expanded. Producing Bio Gas to PetroSA. Producing electricity directly to the national grid. This facility strategically positioned to assist with the processing / management of domestic and hazardous waste originating from the planned Brulpadda project of Total. Madam Speaker, the fight to empower youth and women must be taken to the mainstream economy so that it reflects the diverse character of our district. This year, 2019, marked the beginning of a prosperous year for approximately 120 young people from the Knysna and Plettenberg Bay municipal areas, as they benefited from the Garden Route Municipal Training Programmes, which included First Aid Level 3 Training; Driver’s License Training and Law Enforcement Training. These training programmes originated from the Garden Route Rebuild Initiative (GRRI), established after devastating fires that hit the district (Knysna/Plettenberg Bay) in June 2017, and the need for a District Skills Mecca was identified. The Training Programmes are funded by the GRDM, managed through the Expanded Public Works Programme (EPWP). The project’s primary focus is on youth development in the Garden Route, building capacity among young people; breaking the chain of unemployment and ensuring a marketable labour force in the region. Madam Speaker, during 2016/17 we have offered 140 job opportunities through EPWP. During 2017/18, we have offered 480 and 2018/19 we have currently offered 349. We have transitioned young man and woman to the driving school program, which is underway currently; we have enrolled 23 young woman out of 26 young people. Madam Speaker, We are also offering the opportunity for interns to gain experience through a Municipal Graduate Internship Programme. We are also giving study bursaries to the youth of our district, through my office. Investing in people is the most decisive act of national development. It is through education that we can unleash creativity and cultivate the spirit of resilience among citizens. Lastly, Madam Speaker, you will recall that we have adopted a Concept Note for Garden Route Cultural and Sporting events, which entailed signature events for the district municipality. In the previous DCF and MMF meeting in Knysna the MM shared these planned events with all the Executive Mayors and Municipal Managers. Business Plan on each of these events currently being done and an internal team has been established. In spite of this, for the current year we want to launch and host Garden Route Music and Cultural extravaganza in September 2019. The Garden Route Mayoral Golf Challenge planned for December 2019. Ladies and Gentleman, the Garden Route Mayoral Golf is conceived as one of the legacy projects of GRDM which will at an international level like SA Open, Presidents Cup, PGA Championships and US Open etc. We will use this tournament to market the region as a whole. This tournament will attract amateurs, as well as, professionals who will participate in the tournament. Golf is widely regarded as a sport that promotes development proceeds of these tournaments will be used on the legacy programmes of the Mayor that aimed at community development. The cultural event on the other side promotes cultural exchange and bring communities together united in their diversity. Moreover, it is indicated that festivals are emerging as a fast-growing sector of the tourism and leisure industry and can have a significant impact on the host communities. I would like to thank the Deputy Mayor and Members of the Mayoral Committee for their support. Also special word of gratitude to all the Councillors of the GRDM, especially my colleagues from the opposition for their constructive criticism. I also thank all seven (7) B-Municipality Executive Mayors for their support and encouragement. Mr. Monde Stratu leads the GRDM team with unflagging energy. Thank you MM! The GRDM Senior Management and staff in my office still tolerate me with good grace and endless patience. Madam speaker I would personally like to thank a very special person present here today and I thank her for coming! She is not only an employee of this municipality or a colleague to others; she became a mother in this institution. She has been with this institution for 22 years, happily married, Mr. Jacobus de Villiers, blessed with two (2) children and five (5) grandchildren. I can tell you that she inherited more children in GRDM with MM being her first born. She has worked in Records and Archives, Project Management Unit, Office of the Mayor, at the time of retirement she is the MM’s Personal Assistant. It is indeed emotional to announce that Ms. Erina De Villiers will be retiring on 30 April 2019. She has served this institution with distinction! And we wish her success in her new journey! I must remind her that life begins at retirement! In so many ways, we are a district of firsts. We are the #1 region with two best cities in the country’s top five, the #1 place for young professionals to move, and #1 for quality of living in the country. While economic growth is a priority, we must remain committed to getting our unemployed citizens back to work. Will we sit, satisfied with the progress we have made over the past years, content to let the next chapter in the District’s history simply write itself? Will we seize this moment; seize the chance to grab hold of our shared destiny –- to chart the course to the new future that we want for the District. Therefore, the fundamental question we face as a district at this moment is whether we will seize our future! Will we settle for a district where some are increasingly well off while a large number live nearby in enduring poverty and without opportunity? Will we forge our future together to develop a diverse economy accessible to all, where we grow the pie for everyone, where everyone does their fair share, and where everyone has a chance to succeed? Will we embrace the ambition that we are all better off together? And that, my fellow countrymen, is where the vision of One District is absolutely critical. Well, I am here to say I harbour no illusions of where we are right now. But I am also not afraid to dream of where we can and should be. Admittedly, “One District” is an aspiration … a dream of what we can be. However, it can also be a practical guide for how we share and shape our future together -– a future where more and more of our people see and believe in rich vistas of opportunity; an environment where the Garden Route Dream is embraced as the District Dream. And where every resident lives in the most environmentally sound, sustainable region in the world. Improving the quality of life for all. My friends, let’s take advantage of this moment in our district’s history to seize our future, harness change for the better, and build the elusive “One District” that we all dream of.